Théâtre français de Toronto finishes its 47th season as is usual with a production of Molière. This year it has chosen Molière’s last play, and one of his greatest – Le Malade imaginaire of 1673. In one of history’s strange ironies, Molière died shortly after playing the title role of what has become the most famous hypochondriac in dramatic history. The TfT production had many virtues, but its drawbacks are the miscasting of two of the play’s most important roles. Argan, the title character of Le Malade imaginaire, is the last in the long line of monomaniacs that Molière made the satiric centre of his plays. Arnolphe of L’Ècole des femmes (1662) is obsessed with female unfaithfulness, Orgon of Le Tartuffe (1664) with religious piety, Alceste of Le Misanthrope (1666) with his negative view of society, Harpagon of L’Avare (1668) with money and Monsieur Jourdain of Le Bourgeois gentilhomme (1670) with joining the upper classes. Argan is a hypochondriac who, though perfectly healthy, believes himself mortally ill and dependant on doctors and their medications to keep him alive. How Argan came to be this way, we never know, but the play functions as a satire both of hypochondriacs and of medicine in general, of which Molière had expressed his low opinion many times before. As with all monomaniacs above, the obsession of Argan (Nicolas Van Burek) becomes an impediment to young love. Angélique (Krystel Descary), his daughter by his first wife is in love with Cléante (Christopher Webb), but Argan wants her to marry the young doctor Thomas Diaforus (Sébastien Bertrand) so that he will have ready access to medicine and health advice within the family. Meanwhile, Argan’s young second wife Béline (Bianca Heuvelmans), a gold-digger, has married Argan hoping his ailments are real and that she will soon inherit his fortune at his demise. Argan’s only sensible relation is his brother Béralde, here turned into a sister Béraldine (Julie-Kim Beaudry), but Argan dismisses all she says. The solution to the problem thus falls into the hands of Argan’s clever servant Toinette (Djennie Laguerre). Glen Charles Landry has designed a symmetrical and completely neutral set that could be a room in the 17th century or the 21st with a central door and two wings with wall sconces that could have held candles in the earlier period. Melanie McNeill’s imaginative costumes suggest the 17th century in the men’s shirts and jabots and women’s silks, but the 21st in the men’s black jeans and Béline’s high heels or Angélique’s leggings. Toinette’s outfit of a colourful diamond pattern links her role back to the wily servant Harlequin of the commedia dell’arte. 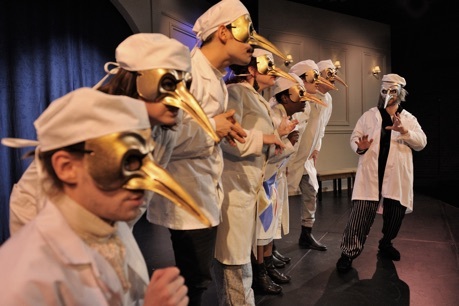 At the final ceremony where Argan himself becomes a doctor he and the whole cast wear the birdlike medico della pesta masks or plague doctor masks based on the real masks doctors wore during plagues in Venice. The main difficulty with the show is that both Van Burek and Beaudry are miscast. Van Burek is certainly the most vigorous, physically active malade imaginaire I’ve ever seen. It is true that Argan is a hypochondriac and is as healthy as any of the other characters. The key point is that he believes he is not only not healthy but close to dying. Van Burek at no point gives us that idea. Any time someone mentions that Argan seems well he has the habit of folding his dressing gown closer around him. But why doesn’t he show us that Argan believes he is constantly ailing and in pain? A Malade imaginaire with such an obviously healthy Argan loses a large part of its humour. Béralde, or here Béraldine, is the raisonneur figure who tries to convince the monomaniac through logic of his folly. This never works but this character is vital in demonstrating how far from reason the central character has strayed. Julie-Kim Beaudry speaks all of Béraldine’s lines very rapidly, without projecting and without changing her intonation. Discreet pauses or emphasis of key words would at least give the impression that Béraldine was emotionally involved in trying to knock sense into her brother. But as Beaudry plays it, the raisonneur seems far too much like a garrulous pedant thus making all the sensible points she makes far too easy to ignore. Fortunately, the rest of the cast play their roles well. Chief among them is Djennie Laguerre, who is very funny as Argan’s mouthy, truth-telling servant and adopts a completely distinct voice and demeanour when she disguises herself as a pompous doctor who condemns the methods of all Argan’s other doctors. Bianca Heuvelmans is amusingly transparent in her hypocritical “caring” for the ailing Argan, and Krystel Descary and Christopher Webb are delightful as the two innocent lovers although there is more humour in the famous music lesson than they convey. Descary shows her versatility in how well she distinguishes Angélique from her younger, more childish sister Louison. The most hilarious scene in the play occurs when Sébastien Bertrand plays Thomas Diaforus, the foolish doctor, who has memorized speeches to impress Argan and his family though its appears he doesn’t really understand what he is saying. Guy Mignault is very funny as the Thomas’s doting father who is oblivious to what a fool his son is making of himself. Le Malade imaginaire is a three act play in prose preceded by a prologue and with musical interludes between the acts. Director Guy Mignault tried to give a sense of this by beginning the play by honouring Louis XIV and through choral songs by Claude Naubert about Argan’s illness. When the play runs an hour and 45 minutes without intermission, the initial prologue which has nothing to do with the rest of the play seems quite unnecessary. Mignault also interpolates a spoken choral passage where the actors give parallels of modern hypochondria as in the modern obsession with physical appearance and diet, but this, too, is unnecessary. A better way to make these links would be to slip a few modern treatments into Argan’s lists of remedies like Botox or colonics instead of enemas and clysters. How Mignault came to approve Van Burke’s performance of Argan that is at such odds with the comic possibilities of the character is a mystery. Yet, chances to see one of Molière’s greatest plays in a professional production in its original language (with English surtitles), or indeed even in translation, come around very seldom in Ontario. The last I recall was Pleiades Theatre’s Dying to Be Sick in 2007. In the TfT production concentrate on the characters Béline, Angélique, Thomas and especially Toinette and you will still have an enjoyable time. Photos: (from top) Nicolas Van Burek as Argan, Bianca Heuvelmans as Béline and Djennie Laguerre as Toinette; the cast of Le Malade imaginaire as doctors, Nicolas Van Burek (far right). ©2015 Marc Lemyre.